"Katie Hopkins to be banished to the Phantom Zone"
Regardless if your political preference is Tory, Labour, Lib Dem, Green or Ukip (nah, they don't exist anymore), there's no denying that the public have really rallied behind Jeremy Corbyn as he led Labour to their best ever electoral performance in 20 years. 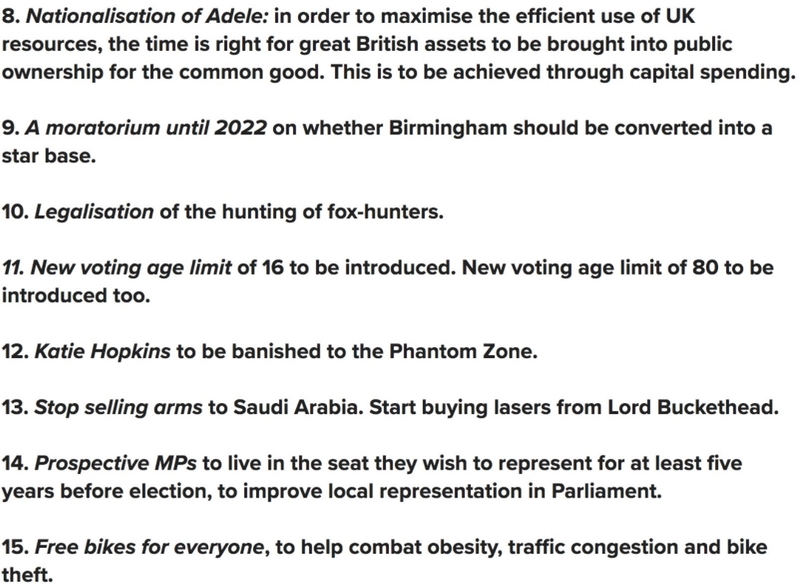 As of now, we've got a hung parliament with the very real possibility of another election on the cards, but in a surprise twist, a new candidate has emerged that really speaks to what the voters want. With established politicians like Nick Clegg losing their seats, it's clear that the public are looking for fresh ideas and a new face. Well, it's a face that's concealed behind a bucket which looks like some weird mix of Darth Vader and a medieval warrior. 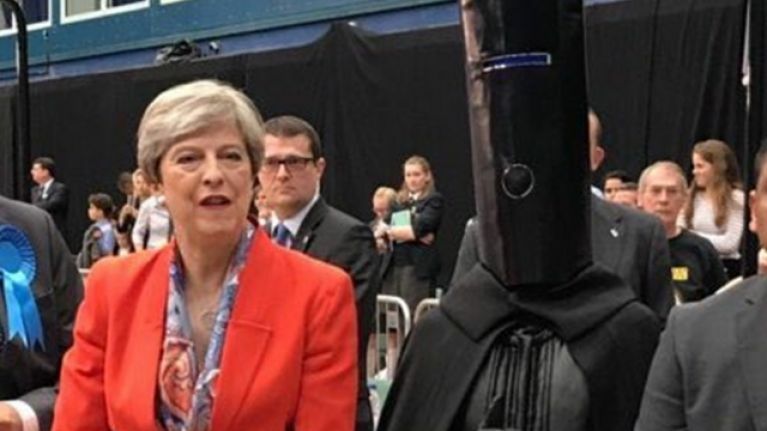 Lord Buckethead was the toast of Twitter as he/she/it somehow managed to take a total of 249 votes away from the prime minister last night in her constituency of Maidenhead. So, what do we know about the world's most beloved and mysterious Lord? 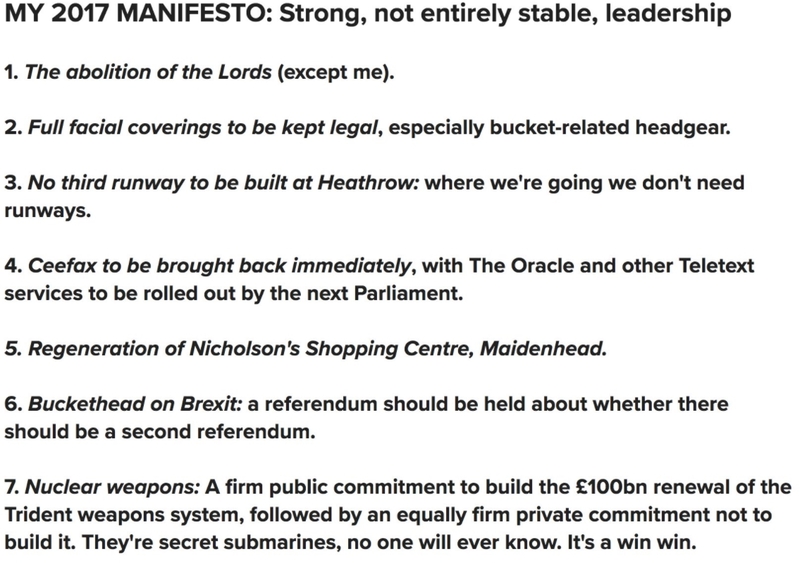 Well, if this manifesto is anything to go by, it's likely that he might have a career in politics. There's something for everyone here, although we do love his policy about bringing back Ceefax and banishing Katie Hopkins to the Phantom Zone. We can see him in Downing Street yet. Not all heroes wear capes, some wear buckets.